Las Vegas 89109 One Day Signs. August 31, 2016 Robert W.
Las Vegas 89109 One Day Signs allows for people coming into Las Vegas for the trade shows and conventions the opportunity to replace damaged or lost signs very quickly. There are many horror stories of attendees of conventions losing their graphics while traveling to Las Vegas or simply forgotten. Also, shipping companies have lost many trade show display graphics by shipping them to the wrong locations and not being able to deliver the signs and banners in a timely manner. Las Vegas 89109 one day signs allow the show to continue. Of course, complex signs that take several days to design and build would not be able to be recreated in time, but banners, signs, banner stands, and other print signage would be able to be replaced. If you find yourself in this situation, take advantage of the large sign industry in Las Vegas and get your graphics replaced quickly. Las Vegas has many sign shops because Las Vegas is the number one destination in the world for conventions and trade shows. Large format printers are the standard of the industry in Las Vegas and professional sign shops have these as one of their tools of the trade. These large format printers can print banners at a couple of hundred feet and hour and also be delicate enough to print detailed posters and signs. The quality of the inks allow for both indoor and outdoor usage of the signs. There are also many sign display tools such as banner stands, foam core, coroplast and other sign displays available for purchase to replace damaged or lost graphics. If you find yourself in need of same day graphics, simply contact a local sign shop with a internet search with the term ” 89109 signs and banners” and you will get many search results to assist you in replacing your graphics. so that the convention and trade shows can go on as planned. August 30, 2016 Robert W.
Las Vegas wide format printing allows for banners and signs to be made. These wide format printers can print large signs and banners with latex and eco solvent inks that are both vivid and bright in color and long lasting. That is especially important when your banners and signs are outdoors in the Las Vegas heat. The technical definition of wide format printing is a printer that can print 18″ up to 100″. These wide format printers are used to print banners, posters, trade show graphics, wallpaper, murals, backlit film , and vinyl films. They also print vehicle wraps, electronic circuit schematics, construction plans, backdrops for theatrical and media sets ( step and repeat banners) and any other wide format signage. The predominant wide format printers are made by Mimaki, Mutoh, HP, Epson and Roland. Several other knock offs are coming out of the Asian countries. These wide format printers are very costly and range from $10,000 to well over $100,000. Las Vegas wide format printing costs vary according to the substrates used to print on. Also there is a big difference in the cost of indoor inks and outdoors inks. Outdoor inks can be used for indoor printing and display, but indoor inks cannot be used for outdoor use without fading, because they lack they necessary protective chemicals to withstand the harsh sunlight of Las Vegas. Usually, wide format printing on vinyl banners is about $2.00 a square foot and printing on vinyl is about $3.50 a square foot. Then the costs go up depending what substrate you apply the vinyl to. Most sign shops in Las Vegas have their own wide format printers to make signs. However not all do and rely upon larger sign shops for their prints. To find a sign shop with a large format printer, do a online search for the term ” wide format printer or large format printer”. August 29, 2016 Robert W.
89109 budget banners are great for companies that are on a budget or starting out. These colorful vinyl banners can get your business or event noticed at a very reasonable cost. Businesses that come to Las Vegas for the trade shows and conventions are using 89109 budget banners because of the cost and convenience. Sign shops near the Las Vegas Convention Center and other convention facilities are close by and it is very easy to pick up or have delivered your banners and signs. In addition to 89109 budget banners, you can also select from a large selection of banner stands and x stands for your graphic displays in a variety of sizes to accommodate your needs. Just because 89109 budget banners are inexpensive, does not mean they are inferior quality. These banners are printed on a 13 ounce banner material with printing inks that are designed for both indoor and outdoor use. These inks produce very bright and colorful colors that bring out the design of your banner. Pictures and logos are also no problem to print on these banners because of the high resolution that the banners are printed at by state of the art wide format printers. These vinyl banners are then hemmed and grommeted for perimeter strength and easy installation. It takes only a few days to have your 89109 budget banners made and if necessary, they can be made at a expedited rate to make sure your event goes as planned. 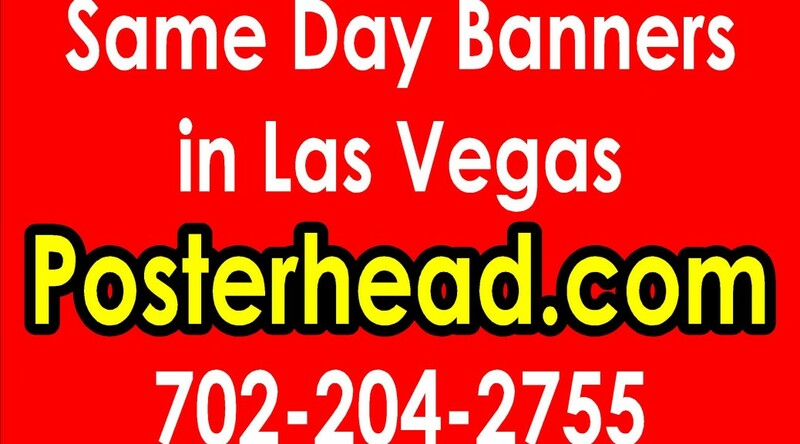 Same day or next day banner printing are available at most of the sign and banner shops in Las Vegas. If you find yourself in Las Vegas for a trade show or convention and need signs, simply do a online search for ” 89109 banners and signs” and you will get many search results back. Contact a few of the shops and determine which banner shops can assist you best with your project. August 28, 2016 Robert W.
Las Vegas custom one day banners are available at a variety of sign shops in the Las Vegas area. The sign business realizes that hundreds of trade shows and conventions come to Las Vegas every year and sometimes graphics are lost or damaged and need to be replaced in a hurry. If you come to Las Vegas and find yourself in this situation, Las Vegas custom one day banners are for you. Or maybe you have a special event in town and you are a local and just need a sign banner in a hurry. Las Vegas custom one day banners can get you a custom printed banner in a hurry. These vinyl banners are printed with wide format printers directly onto a 13 ounce banner material with printing inks designed for both indoor and outdoor use. They can be printed in a multitude of colors that bring to life the design with vivid colors. Since Las Vegas has many sign shops to accommodate the conventions, there is much competition to make your signs, which is very good for the consumer. Las Vegas custom one day banners cost a couple of dollars per square foot and once they come off the printer, they are hemmed to reinforce the perimeter of the banner. Then grommets are added at the top and bottom of your custom banner every 2 feet so that the banner can be installed very easily. They can be hung with rope or have a screw and washer put through the grommet for installation. The custom banners can be made in many different sizes to accommodate whatever size you need. Be it a 10ft x10ft background banner or just a simple 3ft x 8ft banner to be hung on a baseball field. Contact a local sign shop for your one day custom made banner. August 27, 2016 Robert W.
89030 custom banners allows businesses to use low cost, but yet effective, banners to advertise there products and services to the public. This form of advertising is not only parsimonious, but highly effective compared to other advertising methods. 89030 custom banners allows a business to advertise products and services to their customers, along with proprietary information about their business such as websites, telephone numbers, email addresses and so forth. These custom banners can be printed in a multitude of colors to match the color scheme of the stores they are used for. The businesses then use these 89030 custom banners by displaying them to the people who travel by their stores and businesses by displaying them to the people passing by. As the population of Las Vegas has grown, so has the amount of vehicle traffic that uses the city streets everyday. Traffic patterns and counts by the government have concluded that literally thousands of vehicles travel the main streets of Las Vegas everyday. Streets such as Sahara, Eastern, Warm Springs, etc. have the potential for several thousand people to see your store banner each and every day. 89030 custom banners are not expensive and can be made very quickly to adapt to various product specials. The average cost of a custom banner is about $2.00 a square foot. This would include long lasting inks that can withstand the hot sun in Las Vegas without the ink fading. The banners also come hemmed ( for reinforcement of the edges of the banner) and with grommets so that they can be hung with minimum effort. The banners can be printed with a unlimited amount of colors that are bright and colorful. 89030 custom banners can be found at various sign shops that are located in the Las Vegas area. See how these custom banners can help you get more business. August 25, 2016 Robert W.
Cheap banner printer in Las Vegas an get you the necessary banners and signs at great discount prices. While sign shops charge a wide array of prices for signs and banners, they are basically made with the same materials and printers. The only difference is the profit that a sign shop wants to make. For sign shops that do a great amount of volume, they can produce banners and signs at lower costs. Cheap banner printer in Las Vegas can be found through Google or telephone book searches. Simply type in the term ” cheap banner printer” into your search engine and various search results will lead you to a local sign printer. Call a few of them to make sure you get the best deal. The average low cost banner printing in Las Vegas goes for around two dollars a square foot, which includes grommets and hemming. These banners would be full color and can contain images and company logos as well. In fact, these banners, through thee use of state of the art wide format printers, can reproduce pictures taken from cameras with great quality. Of course, the guarantee of a high quality banner from one of these phone pictures lies in the ability of the camera to take a high resolution picture. The Las Vegas sign industry is quite large and most sign shops have state of the art printing equipment to make your banner. The 13 ounce banner material is the standard along with eco solvent or latex inks that are designed to last in the outdoor weather of Las Vegas. These inks are designed not to fade for a couple of years and produce bright and vivid colors that bring to life your image on the banner. Contact a local Las Vegas sign shop for great deals on banner printing. August 24, 2016 Robert W.
Vegas budget banner stands are a favorite at the Las Vegas conventions. Vegas budget banner stands allow for a quality display graphic at an affordable price. 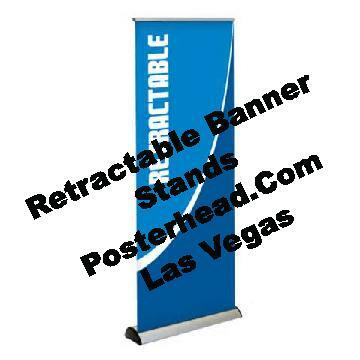 People who come to Las Vegas for the trade shows and conventions like to be able to pick up banner stands in Las Vegas rather than risk damage or graphics being lost while travelling to Las Vegas. Since the banner stands are very affordable, most often than not they are cheaper in Las Vegas than where they came from. This is because Las Vegas has a large sign industry that caters to the conventions and deal in bulk. This bulk allows for a cheaper price, especially when many sign companies are unionized and fetch higher prices. Las Vegas budget banner stands can be as low as $49 in Las Vegas. Many sign stores sell a x stand banner stand ( 24″ x 63″)with print for under $50.00. X stand banner stands come in many sizes. Also available is the retractable banner stand, also known as the pop up banner stand, and those can be purchased in Las Vegas for under $60 for a 33″ x 81″ size. These retractable banner stands come in a variety of sizes and usually come with a carrying case for travelling. The banner stands include a full color print. It takes only a few days to make a retractable banner stand or x stand. Many times if requested, the graphic display can be made the same day or next day as well for a slight upcharge if production schedules have to be made to accommodate the fast made graphic. Simply contact a local sign or print shop in Las Vegas for these banner stands. A google online search or a yellow page search will bring the necessary results. Take advantage of the low cost banner stands that Las Vegas has to offer. Poster Board Printing For Trade Shows. August 23, 2016 Robert W.
Poster board printing is very popular at trade shows and conventions in Las Vegas. Many companies use poster boards at their exhibit booths to help describe their products and services they offer. Many times, they put these poster boards on easels which gives it a very professional graphic display look. Poster board printing is usually done on foam core boards in the 3/16th size or the 1/2″ size. The print is applied directly to the foam core board or printed on a vinyl application and then applied to the foam board. it is often laminated to give it a shiny, professional look that can withstand fingerprints and smudges. Other times, people prefer to have their poster board printing done on 8 or 9 mil poster paper. The poster paper is then applied with a backing and mounted in frames. Poster board printing is not an expensive sign and can be printed and made in just a few days. The cost of the poster boards with a 3/16″ foam is around $4.00 a sq. ft. and the price of the 1/2″ poster board is around $6.00 a square foot. Simple poster paper printing is easier and requires less finish time and sells for around $3.50 a square foot. All these types of signs are full color, meaning you can have a variety of colors on the posters at no additional charge. You can also put logo and pictures on the poster signs as well at no additional charge. These poste board signs are made with wide format printers with inks designed to bring out the colors in a bright and vivid fashion. Poster board printing can be found at most sign shops in the Las Vegas area at very reasonable prices. Simply do a online search with the term ” poster board printing” and a variety of search results will lead you to the right sign and print shop. August 22, 2016 Robert W.
Las Vegas low cost signs are available in the Las Vegas area. While not commonly known, Las Vegas has a disproportionate amount of sign shops for the amount of population. Las Vegas is the number one destination and most popular place to hold conventions , exhibits, and trade shows in the world. Las Vegas has a large amount of convention space and the necessary amenities to attract people to Las Vegas. Las Vegas has gambling, entertainment, fine dining and all sorts of festivities that make people want to come to Las Vegas. Because of the inordinate amount of signs shops, sign making is a very competitive industry in Las Vegas. Las Vegas sign shops boast top of the line sign making equipment that can make quality signs quickly and competitively. The average price of indoor / outdoor banners is about $2.00 a square foot and many times sign shops will have specials on vinyl banner printing. One of the current specials and most popular banner specials in Vegas is the 3ft x 8ft vinyl banner ( full color) that goes for under $40.00. This vinyl banner is large enough to be seen from a long distance and can be hung from a business store front and be seen by the passing vehicle traffic. Las Vegas low cost signs include a variety of signs such as aluminum, acrylic, pylon lettering, coroplast, metal, etc. etc.. Residents and businesses can take advantage of the off months for sign shops ( summer months when the convention and trade shows are not in town) and get their business signs made quickly and cheaply. As the sign saying goes, ” A business without a sign is a sign of no business.” Contact a local sign and print shop in the area and take advantage of the sign specials that Las Vegas sign shops have to offer.